1. the Layout – we custom design each ceiling to suit the size of the room and other features that affect the ceiling such as lighting and ductwork. 2. the Grid – the grid itself (mainrunners and crosstees) comes in 2 designs, 3″ wide and 2″ wide. The 3″ wide grid is plain and looks more like a beam. It is the most popular. 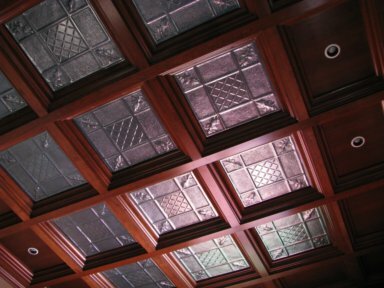 We also offer a 2″ wide grid which has a detail in the center. 3. the Depth of Coffer (or drop-in-panel) – we offer the Deep Coffer, Medium Coffer and also a Flat Panel style. 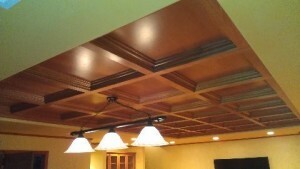 If you have 8’6″ ceilings and higher, you can easily use the Deep Coffer style. If you have 8′ ceilings, the Medium Coffer would be a good choice. If you have low ceilings or just want a flat look, you can go with our flat panel. The grid shown in this photo is 3 inches wide and is smooth on the face. It looks more like a beam and is typically laid out 32 inches on center for the Deep Coffer and 30″ on center for the Medium Coffer style. The grid shown in this photo is 2 inches wide and has a detailed shape in the face of the grid. 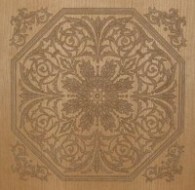 This photo shows the 2″ grid laid out 25 inches on center with 24″ x 24″ Deep Coffers. The Deep Coffer is the most popular depth and uses a 4-5/8″ crown. It takes up 4″ from the face of the grid to the back of the coffer. 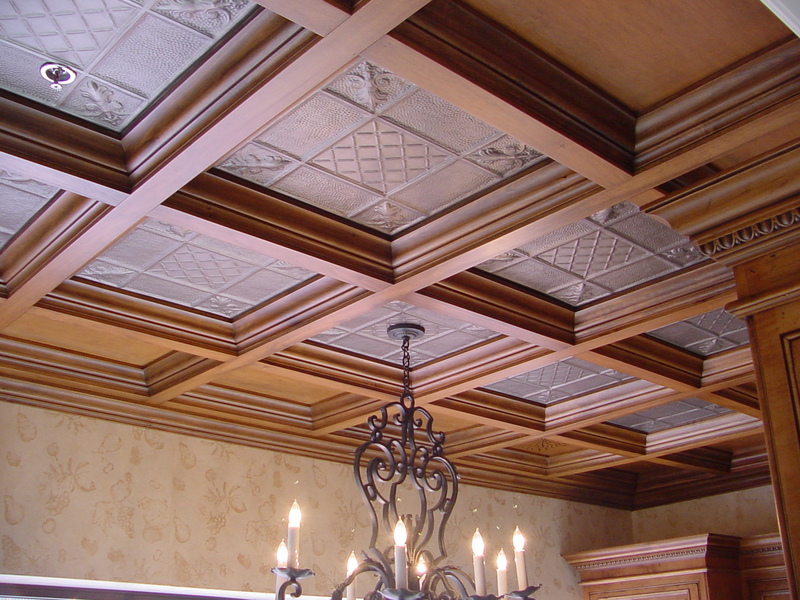 If you are suspending the grid from a drywalled ceiling, you will need 7″ of vertical space. This will allow you room to angle the coffers up thru each. Medium Coffer takes up 1″ less vertical space than the Deep and is often used in rooms with ceilings at 8′ or less. It uses a 3-1/2″ crown. It takes up 3″ from the face of the grid to the back of the coffer. 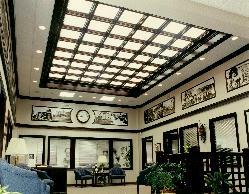 If you are suspending the grid from a drywalled ceiling, you will need 6″ of vertical space. 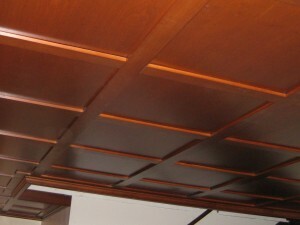 This will allow you room to angle the coffers up thru each. We also offer a flat panel which is often used in basements and other areas where the ceiling height is low. 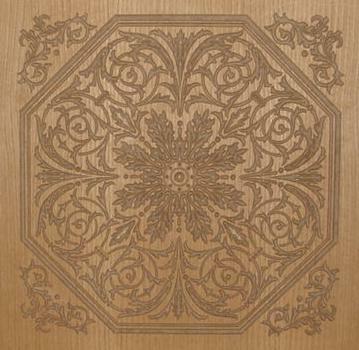 Most often we use 1/2″ plywood with a matching wood veneer as the flat panel. 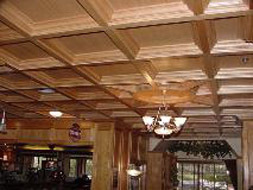 You could also use acrylic panels, acoustical tiles, tin panels, mirrored panels. There are many ways to accent the WoodGrid® Ceiling System.